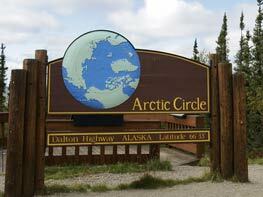 Arctic Circle Tour | Alaskan Arctic Turtle Tours, Inc. Explore Alaska’s wondrous Arctic in our one-day Arctic Circle tour. Your trip will begin early in the morning when your guide picks you up from your hotel or bed and breakfast. You will hit the highway by 6:30 a.m., driving north up the Steese Highway past the mining town of Fox. Here, you will get your first view of the trans-Alaska pipeline, which carries oil 800 miles from Prudhoe Bay to Valdez. Your first stop will be 66 miles north, at the Tolovana River Rest Area. Here, you’ll have a few minutes to stretch, use the restroom and admire the view of the foothills. You’ll then proceed 70 miles further north on the Dalton Highway to the next rest area for more scenic viewing at a place called 100 mile. 36 miles from there, you’ll stop at the Mighty Yukon River, Alaska’s longest river, which travels 2,300 miles from the northwestern British Columbia to the Bering Sea. Your guide will travel slowly across the long bridge, so you can take pictures of the river below. Your next stop will be 44 miles later at Finger Mountain, where you’ll have a 360-degree view of the Arctic and its changing tundra. By noon, you’ll reach the Arctic Circle itself where you can have your picture taken by the sign proclaiming you’ve reached the Arctic. Here, you’ll have your lunch provided by your guide and plenty of time to explore the nearby area. On the drive back, you’ll stop at several places for picture-taking and stretching. Your guide will drop you off wherever you are staying by 6:30 p.m. At the end of your trip, you will receive an Arctic Circle Certification with your name and the date you touched foot in the Arctic. Throughout your trip, your guide WILL pull over and stop whenever you see wildlife, so that you can watch or take pictures. Moose are seen frequently along the roadway throughout the trip. 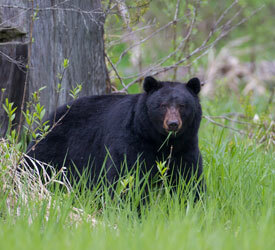 Near the Tolovana River Rest Area, you may spot a black bear or possibly a grizzly bear. Near Finger Mountain, grizzly, fox, wolves, and occasional caribou are seen. Smaller animals, such as porcupine or marmot are also spotted along with several species of birds. The cost of the Arctic Circle Tour is $199.00 per person Minimum four people. 3 people $275 Per Person. 2 people $400 per person. It includes lunch, drinks, and snacks.